Theni District Court Notification is out. Theni District Court is recruiting for 80 Office Assistant, Computer Operator and Other Govt Job Posts. You can check Theni District Court - District Court of Theni last date, download Theni District Court notification, visit Theni District Court official website and check other Theni District Court Vacancy details.Complete Vacancy and recruitment Details about 80 Office Assistant, Computer Operator and Other Govt Job vacancies in Theni District Court are provided below by JobSarkari.Com only for you. Last Date for Submission of Application Form 30/11/2018 till 05:45 PM. Driver Candidate Must Have Passed Class 08th and Driving Licence for Motor Vehicle With Five Years of Experience. 04. Senior Bailiff Candidate Must Have Passed Class 10th. 04. Examiner Candidate Must Have Passed Class 10th. 05. Xerox Machine Operator Candidate Must Have Passed Class 10th and Having 06 Month Experience in Operation of the Xerox Machine. 10. Office Assistant Candidate Must Have Passed Class 08th. 26. Night Watchman Candidate Must be Able to Read and Write. 11. Masalchi Candidate Must be Able to Read and Write. 07. Sweeper Candidate Must be Able to Read and Write. 04. Computer Operator (Temporary Post) Candidate Must Have Passed Graduation in Computer Science / Computer Application With Typewriting Junior Grade – English & Tamil or B.A.,/ B.Sc.,/ B.Com With Diploma in Computer Applications and Typewriting Junior Grade – English & Tamil. 07. Candidate Must be Able to Read and Write. 02. Maximum Age for UR 30 Years. Maximum Age for BC and BC(Muslims) 32 Years. Maximum Age for SC/ ST (Arunthathiyar) 35 Years. 1.Written Test / Viva - Voce Test. The Principal District Judge, Principal District Court, Theni – 625 523 On or Before 30th November 2018. Q. 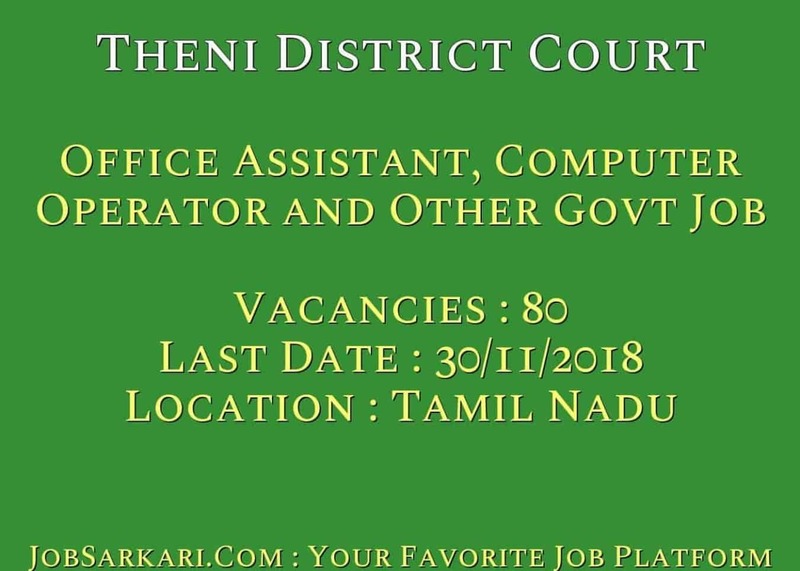 What is the Last Date For Theni District Court Office Assistant, Computer Operator and Other Govt Job Vacancy ? A. 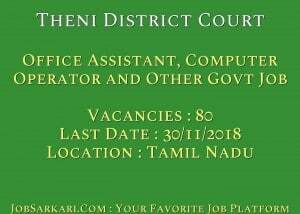 Last Date for Theni District Court Office Assistant, Computer Operator and Other Govt Job Posts is 30/11/2018. Q. What is the Form Type of Theni District Court Office Assistant, Computer Operator and Other Govt Job Recruitment ? A. The Form Type for Theni District Court Office Assistant, Computer Operator and Other Govt Job Posts is Offline. Q. How many vacancies are available in District Court of Theni Office Assistant, Computer Operator and Other Govt Job Posts ? A. There are about 80 Vacancies in District Court of Theni Office Assistant, Computer Operator and Other Govt Job Posts. Q. What is the Full Form of Theni District Court ? A. Full Form of Theni District Court is District Court of Theni . sir me s.c.cast ka hu. aur me .10 class paas hu. sir muze job chahiye. plz. thanks. sir. Aap is Post k Liye Apply Kr Sakte Hai..
Sir mai SC cast ka aur mai 8th pass hu..
Aap is link se 8th Pass Jobs k Liye Apply Kr Sakte Hai..
You can Check All Latest Sarkari naukri Through This Link..